All the mounted drives (this includes USB drives, NTFS and other partitions that you set to automount, etc. - basically everything that's in /media) show up in the Ubuntu Unity launcher by default which is usually ok if you have a big monitor or if you don't have a lot of applications pinned to the Launcher. But if you use a netbook or just want more space on your Unity launcher, here's how to change the launcher behavior so that it doesn't display any mounted drives. But firstly, here is how to unmount external devices. A. 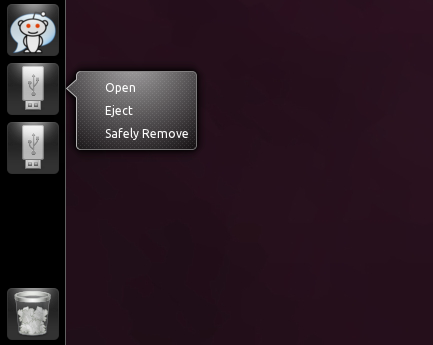 Open Nautilus, right click on the mounted device and select "Eject" or "Safely remove drive". Once installed, press ALT + F2 and enter "ejecter" to run it. To run it when your computer starts, open "Startup Applications", add a new startup item and add "ejecter" for both the name and command. There is another appindicator called "indicator-usb" but unfortunately it doesn't seem to work anymore (when running it on my Natty installation, nothing happens). By the way, for a huge list of AppIndicators, check out this AskUbuntu question. Now that you know how to unmount external media easily, let's remove the mounted media icons from the Unity launcher. 2. Press ALT + F2 and enter: "dconf-editor", then navigate to desktop > unity > devices and change the "devices-option" value from "OnlyMounted" to "Never". 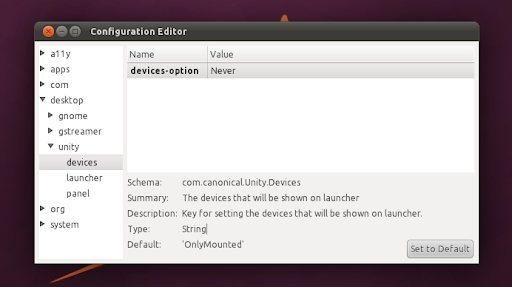 That's all - the mounted usb drives (or any other mounted volumes) should now stop showing up on the Unity launcher. Then open CompizConfig Settings Manager, click on the "Experimental" tab and under "Show devices" you can select to only show mounted drives or never show them on the Unity launcher. With Ubuntu 12.10, it's a lot easier: simply right click it and select "Unlock for Launcher"
Mounted drives are displayed both on the Unity launcher and on the desktop in Ubuntu 11.04 only. If you decide to keep the default Ubuntu 11.04 Unity launcher behavior and display the mounted media icons on the launcher, there's really no reason to have the mounted volumes show up on the desktop too. Really now, why both on the launcher and desktop? You probably already know how to do this, since this is an option in Ubuntu Tweak but if you don't want to install Ubuntu Tweak just for this, to remove mounted volumes from your dekstop, press ALT + F2 and enter: "gconf-editor", then navigate to apps > nautilus > desktop and disable (uncheck the box) "volumes_visible".